Camelot is a T.V. show based pointedly on Arthur, and Merlin. It is about their relationship together, very much like teacher, and student. Camelot is a fantasy/drama, using a few historical facts that they will add in to go along with the legends of King Arthur, and his Knights of the round table. The story line of the show starts a few decades after Britain's freedom under Roman rule. After the death of King Uther, Britain goes into a chaos, it is now vulnerable, especially from the Saxons. Merlin has thus appointed the son, and heir who was raised as a commoner, to the throne. Arthur will start to show strength, and more leadership with the guidance of Merlin, which is more than any other Kings, and Lords who also rule lands in Britain. Camelot is a wonderful story of romance, and politics. It shows Arthur's struggle to make a better world for the people of Britain, with Merlin's guidance. In his struggles to learn to be a good leader, and King. Arthur's half sister has made other plans and ideas though, causing a bit of turmoil for Arthur. The show was created by Chris Chibnall and, Michael Hirst. Chibnall, is a British playwright, who has also done a vast amount of work with other television series. Hirst, an English screenwriter who is well known for a few English based movies, as well as a Emmy award winning T.V. show. The show was produced by Graham King, and Michael Hirst. The first show "Homecoming" aired Friday night, 25 February 2011. After Chris Chibnall took over as CEO of Starz, the show got the green light to air. Camelot, playing in the U.S., as well as England. Arthur struggles to defend himself against the mercenaries on Bardon Pass. Morgan leads Sybil and her followers to Camelot where she receives information that leads her to believe the throne is within her grasp. Arthur and his men learn of an attack at Bardon Pass and ride out to defend it. Merlin realizes he's been seduced by a shape-shifting Morgan. The men begin to lose faith in Arthur after learning of his betrayal. Morgan puts on a feast for King Arthur and his Knights at Castle Pendragon, which turns to panic as the castle comes under attack. As Arthur and Morgan's men join forces to fight, Merlin believes a plan is afoot. Kay and Leontes seek out a trusted new warrior to join them. Arthur and Merlin accept an invitation to join Morgan at her castle for dinner. Arthur is forced to concede defeat in his pursuit of Guinevere. Part 3 of this magical production, recorded at Broadway's Winter Garden Theatre in 1982. Part 2 of this magical production, recorded at Broadway's Winter Garden Theatre in 1982. When King Uther dies, the sorcerer Merlin travels to collect Arthur, a young man he believes can bring an end to the darkness of the land. But Uther's daughter Morgan sees the crown as her birthright. Part 1 of this magical production, recorded at Broadway's Winter Garden Theatre in 1982. Camelot is currently available to watch free on Tubi TV and stream on Acorn Media. 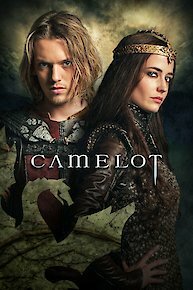 You can also stream, download, buy, rent Camelot on demand at Amazon, Hulu, Starz, DIRECTV NOW, iTunes online.